Reality TV contestant Dr Katherine Schmidhofer, and her partner Chris Jeffrey, welcomed their son Hugo Clifton on June 11. Katherine is a child psychologist who took part in the first season of The Bachelor; she has also written a book about her experiences as a breast cancer survivor. 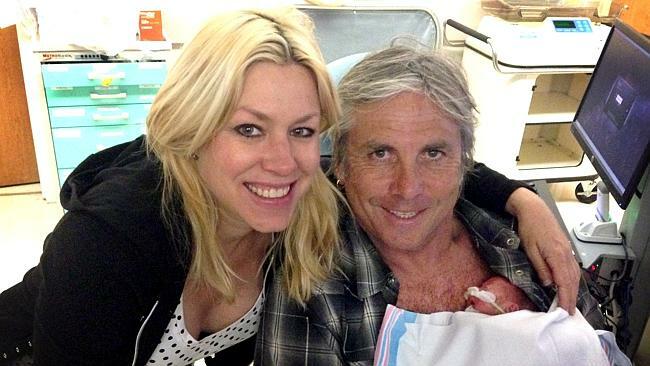 Brisbane rock scene mainstays Kylie Lovejoy and Brendan Wright welcomed their son Phoenix Koa on June 9 [pictured]. Phoenix was born unexpectedly while Kylie and Brendan were on holiday in Hawaii, arriving three months before his due date. Phoenix has had numerous health issues as a premature baby, and will remain in a Honolulu hospital until September. The name Phoenix had already been chosen in advance, but now seems very apt, while the Hawaiian name Koa was chosen because of his birth place. Kylie is a musician and musical festival organiser while Brendan is a sound engineer. Phoenix’s surname is Wright Lovejoy – it is a growing trend for babies to have both parents’ surnames, but this is a fairly rare case where the mother’s surname comes second. Exercise guru and businesswoman Emma Seibold, and her husband Matt Kane, welcomed their daughter Isla Rose in January, a sister for Xavier. Emma is a yoga and Pilates instructor, and a fitness coach who is the founder of juice detox program Urban Remedy Cleanse. She has also developed the Barre Body fitness training technique.